Quick Note: My gluten-free expert of a friend, Chris (author of Irresistibly Gluten Free), has started a gluten-free blog with recipes, tips and the most exciting – weekly meal plans for gluten-free eaters/households that include recipes and shopping lists! Seriously amazing. I am constantly hearing from those of you wanting and needing to cook and bake gluten-free and I know this will be a great resource to many of you. Check it out! Cowboy cookies to be exact. Think of it as a classic chocolate chip cookie pumped up in a major way. These babies are loaded with coconut, chocolate chips, cornflake crumbs, and walnuts (if so desired). I’ve made at least three or four batches of these in the last month and we’ve been pulling the baked cookies out of the freezer right and left as after-dinner treats and we still aren’t sick of them. I love the delicious combination of the slightly crunchy, savory cornflake crumbs and the sweet coconut and chocolate. Very yummy. I adapted the recipe slightly from the one that BriAnn (a MKC reader – thanks, friend!) sent me based simply on the fact that the first few times I made the cookies, they didn’t flatten at all and so I reduced the oats and sugar to accommodate that – and ended up with the perfect cowboy cookie! This brings me to a little note about cookies. Strangely enough – different ovens, altitude, elevation, climate, butter temperature, and a whole myriad of factors can affect the outcome of your cookies and other baked goods. If you don’t love the result the first time you try a recipe – don’t give up! If your cookies bake up too lacy and buttery and flat, double check that your butter wasn’t too soft or try adding a couple tablespoons more flour, especially if you live at a high elevation. If your cookies bake up like round domes instead of flattening beautifully, make sure your butter is soft enough and not too cold or decrease the flour or other dry ingredients by a couple of tablespoons. I can’t tell you the number of times I’ve made a cookie recipe and thought – oh, these did not turn out like I wanted at all! And then I’ve gone back to the drawing board and experimented with a few of those factors to achieve cookie perfection the very next time. Cream together the butter and sugars until light and fluffy. Add the milk, vanilla and eggs and beat well. Stir in cornflake crumbs and oatmeal. Add the flour, baking soda and salt and mix. Stir in the coconut, walnuts, if using, and chocolate chips. Place tablespoon-sized balls of dough on a lightly greased or lined cookie sheet and bake for 10-12 minutes until lightly golden around the edges. I’ve made these with both rolled oats and quick oats and we slightly prefer the quick oats so that the oats meld together with the cookies a little more but you can use whichever you have on hand. Recipe Source: adapted slightly from BriAnn H.
I am for sure making these this weekend. I make a cowboy cookie now, but it just has oats, coconut and choc chips. I wanted one that looked more festive so I will be adding in dried cranberries and chopped walnuts as well. I hate coconut with a fiery passion, but I’m certain that I’d be missing out on some texture without it in this recipe. Any suggestions on how to make these without coconut? You could just leave it out and maybe slightly increase the oats? I am nearing the end of a batch of cowboy cookies from the Feb/Mar 2017 issue of Cook’s Country. They are so amazingly good that I had to come see if you had ever posted a version. I will need to give this a try because the cornflakes intrigue me! And if you haven’t made the CC version yet, you absolutely should. They are ridiculous. Is it Laura Bush’s recipe? Hi Karen – sounds like you might need a few tablespoons more flour – usually flat cookies are because they are underfloured or the butter is too soft/melted. Do you think that could have been a factor? Mel, just wanted to say how much of a family favourite this recipe has become. I’ve made them for just having around, taking to festivals or to work but the biggest hit so far is when my son left for uni. We made approximately 17 gazillion of these (so lovely to have that one last proper baking time with him) and he used them as ice-breakers in halls (halls = UK, dorms = US), he made friends very very quickly + had the added bonus of a taste from home for a week or so 🙂 He’s vegan so I use more apple sauce to account for no eggs and coconut oil to make up for the butter. A week or so before I go and visit I’ll invariably get a text along the lines of ‘erm, I don’t suppose you’ll have time to bake before you come up will you…?’ It’s always these. Thanks Mel! I love this! What a neat thing to bake with your son – he’s a lucky guy! Made these today for afterschool treats and they are great. Thanks! When you freeze these cookies and pull them out for after dinner treats, do you just sit them out at room temp for awhile? If you aren’t freezing, do you store in the fridge? Just found your blog and it seems very nice. Can’t wait to try more recipes. Thanks!! Hi Michele – yes, usually if we pull them out of the freezer before we start eating dinner, they are perfect by the time we are ready to eat them. If we don’t plan ahead, a few seconds in the microwave easily does the trick. If I’m not freezing them, I store them well-covered at room temp. The last batch is in the oven now – I added dried cranberries and raisins – and I didn’t have 2.5 cups quick oats – so I used what I had left of the package of quick oats I had (about 3/4 cup) and I used rolled oats to make up the difference. Result – quite good! Thank you! Can I just say … I love you? Inappropriate — sorry, but I do! 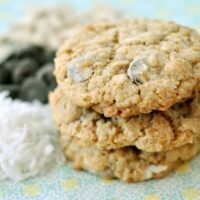 I stumbled on your April 27 2009 “Favorite Cookie” which had oatmeal, choc/chips and coconut. I was going to use that recipe and add Frosted Flakes in an attempt to make my (late) Grandmother’s “Best Ever” Cookies that all us cousins grew up on. Well … morning of making above cookies, I searched for the recipe and found these instead. What a golden dig! P.S. My Grandmother was as “Cowgirl” as you can get. All her childhood stories involved herding sheep, rodeos, and summer cattle drives. These sound great! I am not a fan of coconut, but I might play around with it and add peanut butter! Melanie – I’ve never tried it but if Special K is similar to cornflakes then it would probably work just fine (I’m not super familiar with Special K). Measure the cereal after crushing. Do you think I could use Special K for the cornflakes? And should I measure the cornflakes after crushing or before? Thanks! I made these simple to make cookies and sent some on my sons scout camp out and brought some to work yesterday. They were a big hit, everyone loved them. Okay, I made the Cowboy Cookies again this week & followed your instructions concerning “flat & lacy”. I added some flour & they turned out perfect this time!! Just as dangerously yummy as before!! Thanks for the tips – I never would’ve known what to do! Man-oh-man-alive! Mary made a batch today and I can’t keep my hands out of them. Great textures and flavor combinations. She provides baked goods on a regular basis to several Firefighting Engine companies that park their rigs behind our home while they shop for the groceries for their evening meal. So she’s always looking for something new to change things up for them (and me too). I think she’ll have to make this recipe over and over again so that each crew gets at least one batch of them before she moves on to the next recipe. Love your findings. THX for sharing with the rest of us. You’re a terrific resource for things new and exciting. My husband hates that I eat cookie dough, but I just can’t resist! And this cookie dough is to die for! 🙂 So yummy. I didn’t eat ALL the dough and did also make some cookies. I left out the chocolate chips and walnuts, baked some that way, and then added white chocolate chips and craisins to the dough and baked some that way too. Yummy! Ahh….these are soooo good! What a marvelous taste of the combination of cornflakes, walnuts, chocolate chips and coconut! I will be making these again and again! Thank-you! is it me or are Cowboy cookies the rage now? EVERYONE is talking about them. Haha. I think it must be a sign that I’ll have to make them. I am definitely looking forward to it! Mel, thanks for the cookie tips. These looks great. 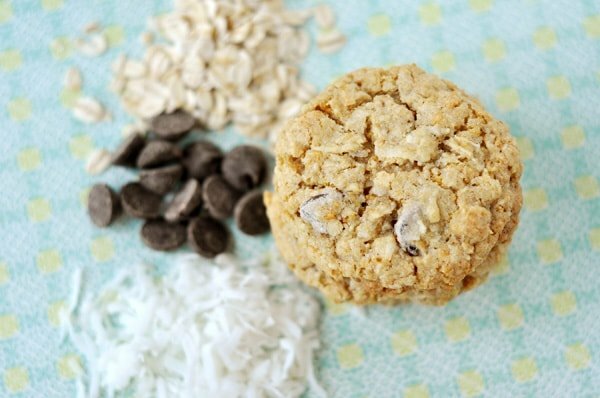 Just made your oatmeal coconut chewies last night -so yummy too! I’ve always wanted to bake these things but have never gotten around to it and I’m the type of person that will just take two cookies, load some other good stuff between them and have a cookie sandwhich :). Regarding ingredients: Flour is definitely a main contributer when dealing with how much a cookie spreads. The problem is the weight of one cup can vary, depending on the method of measuring, from 120g to 145g. That’s a huge difference when dealing with small items like cookies. I had a maple cookie recipe for Christmas that spread to rice paper thin and I didn’t have enough time to play with the recipe, so I just dumped it in a brownie pan and made bar cookies :). For me 1 cup = 130g. Anyways, these look great, and you’ve made me very very hungry :). Cowboy cookies are a very top list cookie for me! I love these! These cookies sound very yummy! I’ve had a look around your website, very impressive, I will be back. Enjoy your day. Sierra- Thank you for the suggestion! I think white chocolate chips with the coconut and macadamia nuts will be a great combo- perfect for a Luau themed party! I also can’t wait to try them just as Melanie has posted…they really look and sound amazing as is! 🙂 Thanks again! I wouldn’t be sick of these cookies either! Yum! Mmm, these look so delicious Mel! Right up my alley for dessert, snacks or even breakfast, haha. Great job on them and thanks for sharing! Thanks for the info about the gluten free recipe blog! I am passing it on to my friend whose husband was recently diagnosed with Celiac’s disease. This is one gorgeous cookie! I am off to make these cookies right now and freeze them for my upcoming Luau party. They have coconut in them, and if I sub macadamia nuts for the walnuts they can be considered “tropical”, right? 😉 Thanks, Melanie! Have a great weekend! These sound really good and I’ve been wanting to bake some cookies. I love coconut, but the other members of my household do not. If I leave that out, do you think I’ll need to adjust the cornflakes or oats measurements to compensate? Hi Karen – Yes, you could leave out the coconut but you are probably on to something by adjusting the oats up a bit to compensate. The oats absorb more liquid than the coconut so I wouldn’t sub a whole cup of oats in place of the cup of coconut, but maybe an additional 1/4 to 1/3 cup. Hope they work out! 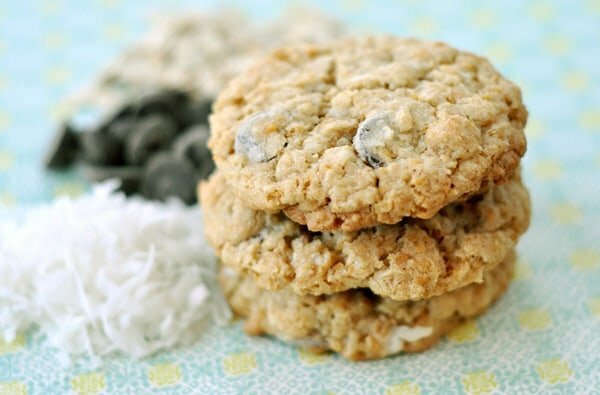 Kim – love the tropical take on these cookies. Macadamia nuts would be incredible! Oh my, these cookies sound delicious. Thanks for the recipe. Bookmarked it for later use. Hope you’re having a great day. This is an awesome sounding cookie.